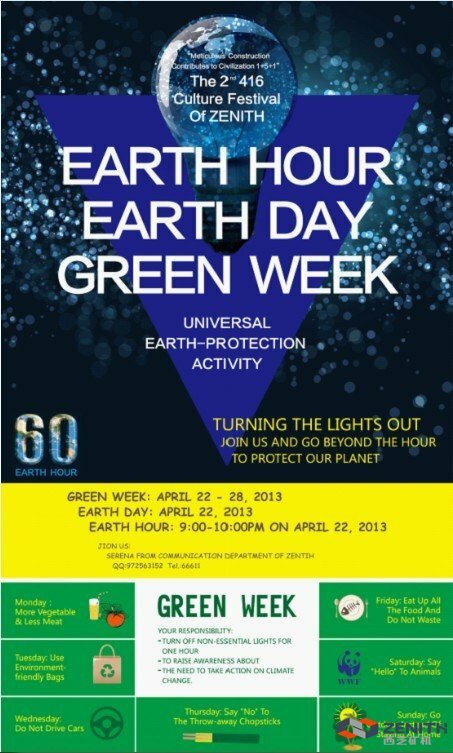 ZENITH Initiated Activity of "EARTH HOUR - EARTH DAY - GREEN WEEK"
Nowadays, an universal earth-protection activity "Earth Hour · Earth Day · Green Week" has been launched in ZENITH.This activity calls all employees to protect plant by turning the lights out and going beyond the hour. According to the planner, this activity immediately stirred up enthusiastic response when it was released on the intranet. Lots of white candles are prepared for volunteers to take home, for earth protection belief needs to be shared with family, friends and even with lovely dogs. With candles, one can still enjoy life when closing appliances. "One hour is just a start, and we hope everybody could step forwards regarding the environmental protection and energy saving. From the hot response, we believe that everyone is willing to contribute to our green home." The next day to Earth Day, some volunteer expressed his thoughts, "Computer was always by my side, and last night I tried to stay in the dark on my own, without computer of course. I found the feeling was perfect, for I recalled my memories and enjoyed the stars outside during the hour. It would be a better way to relax." In addition to the activity of turning lights out, "Green Week"commencing from April 22 also was proposed in ZENITH, such as "More Vegetable & Less Meat"on Monday, "Use Environment-friendly Bags"on Tuesday, "Do Not Drive Cars"on Wednesday, etc. Through little change in seven days a week, one can practice his concept of environmental protection step by step. Each volunteers would get a customized environmental shopping bags, and ZENITH hopes every employees could take his or her earth-protection belief into practice in the daily life.